Balance bikes help the child to achieve better balance and coordination. They lack stabiliser wheels and help the child get used to a real bike. 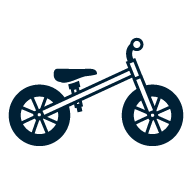 You can begin using a balance bike from the age of five. Choose whether there should be a bell and a basket. Larger models sometimes have a foot plate below the saddle. Avanti Bikes Lil Ripper 12"
Apollo Bikes Neo Jr 12"